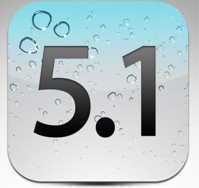 Last week at the Apple iPad event, not only Apple has launched the new iPad but it also released the iOS 5.1 update. iOS device users can update their iPad, iPod and iPhone to this latest version of iOS. If you are already on iOS 5 , you can do software update directly from your device without even connecting to computer. Though this new update has many features like Japanese Language Support for Siri, option to delete photos from Photo Stream, addresses bug fixing battery life and few others. But undoubtedly the best feature update is made to the Camera. Now with this update you can directly access your camera from the lock screen. Just slide the camera icon on the lock screen and it will enable your camera for taking quick photographs. Earlier it was such a pain to unlock the phone and start the camera app to take the pictures especially when you want to click a particular moment. Other Camera update includes better face detection which can now detect all the faces and a redesigned camera app for the iPad. Have you updated your iOS device to this new update. and did you like it.. Share your experience in the comment section below or connect with us on our FB Page. You were able to take a picture without unlocking the phone iniOS 5.0. The only difference is that instead of ‘sliding up’ to reveal the camera app you could only push the camera icon to start the camera app. So there’s a slightly slicker UI change but the functionality was previously there. Nice improvement though.